Is your team scattered across various locations? Stay in touch and work together in real-time thanks to our audio conferencing solution! A hit with our clients who ranked it among their favourite features in a recent survey, our audio conferencing is now even more convenient and user-friendly! Victor Bruzeau, our Senior UX Designer, explains why. 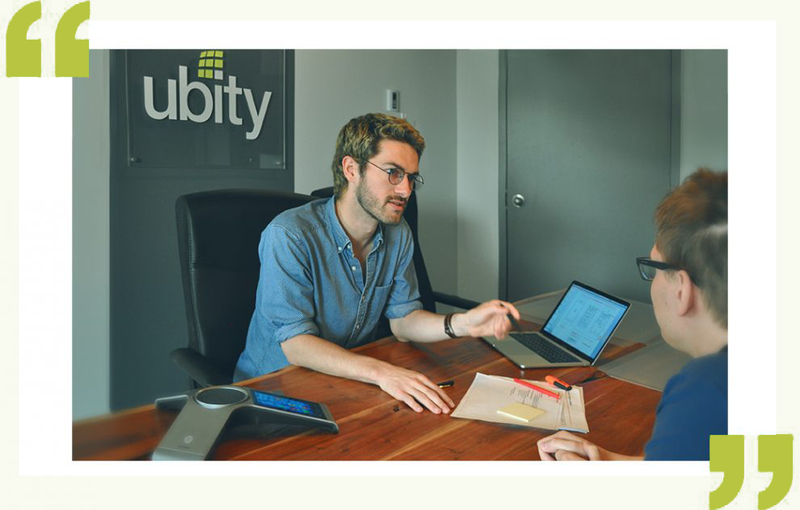 What advantages does Ubity’s audio conferencing solution offer? No matter the size of your company, our audio conferencing solution allows you to quickly bring your staff together while saving on travel costs. If, for example, you needed to discuss an important matter or make a quick decision, simply go to our dedicated client portal. In just a few clicks, the meeting is set up. You may invite three participants or more. What are the new features of this upgraded version? It is now even more user-friendly and intuitive. The conference administrator now has tools to moderate the meeting. For example, if someone joins the meeting by mistake, the administrator can easily disconnect the user. 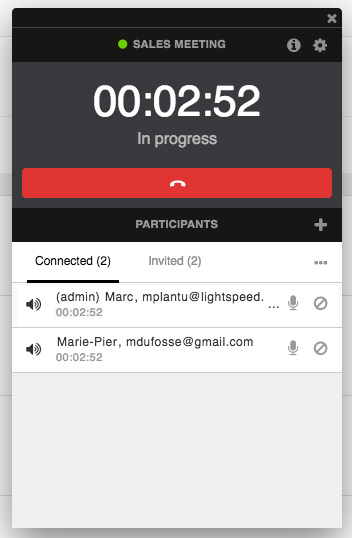 Thanks to a single graphic interface, the administrator can also now invite a new participant, see who is connected or who is speaking. Access the call recording. He or she can immediately listen to what was said during the meeting and share it with the other participants. See at a glance who attended the meeting and for how long. A conference history now appears on the dashboard. 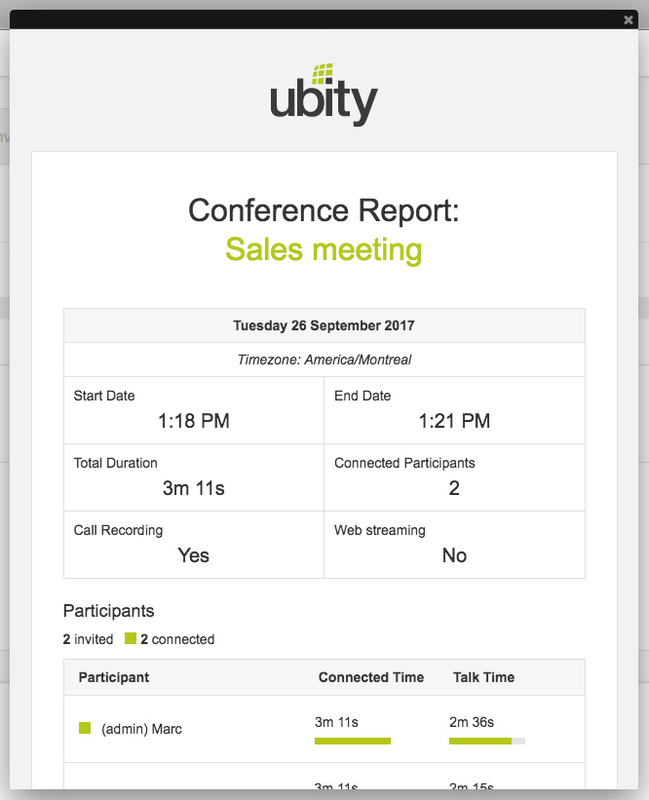 For those who hold regular meetings, this new feature is particularly useful because it allows them to save and index meetings from the last six months. Conferences in progress and those which have already been held are clearly separated, which is particularly handy if you handle a high volume of meetings! Online audio conferencing option is also available. This feature allows you to host audio conferences via the Internet. It is especially practical if you want to create webinars with your clients! Finally, we polished the invitation email. Its design is clear, professional, and reflects the quality of our service. What’s more, it is available to all of our clients. Boost productivity and get started with audio conferencing now! For more information, please contact us at 514-907-3400 ext. 1, or by email at sales@ubity.com.